The Union of European Football Association (UEFA) Champions League, also known as the Champions League, is a competition encompassing the European continent. It is one of the most prestigious and spectated tournaments in the world with monumental bragging rights to the club who ultimately wins the championship. The present-day Champions League established it roots from the European Cup which originated in 1955 and started with sixteen clubs from various European countries such as Italy, Poland, Scotland, France, West Germany and Sweden. The first ever match took place on September 4, 1955 between Sporting CP from Portugal and Partizan from Yugoslavia. The game ended in a 3-3 draw. Spain’s Real Madrid began its dynasty of the European Cup early on having won five consecutive titles. 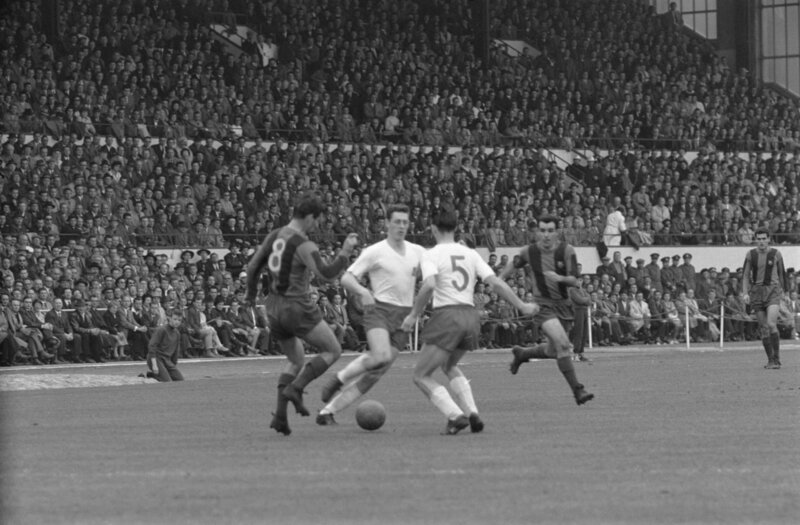 Bitter rival Barcelona finally dethroned them in the 1960-61 season only to succumb to Portugal’s Benfica, 3-2 in the final. The Cup lived on the Iberian Peninsula until the 1962-63 season when Italy’s Internazionale (Inter Milan) lifted it up for the city of Milan, Italy. Real Madrid would add five more cup victories making it the most successful club in the history of the competition to-date. In fact, Spanish clubs have accumulated 14 Cup victories while English and Italian clubs are behind with 12 apiece. In 1992, the UEFA Champions League competition replaced the European Cup and added a group stage to the tournament, replacing the sudden death knockout-style format of a country’s top team. Now, 4 teams from Europe’s top leagues are sent to the competition. The number goes up to five for the 2015-2016 season and onwards. 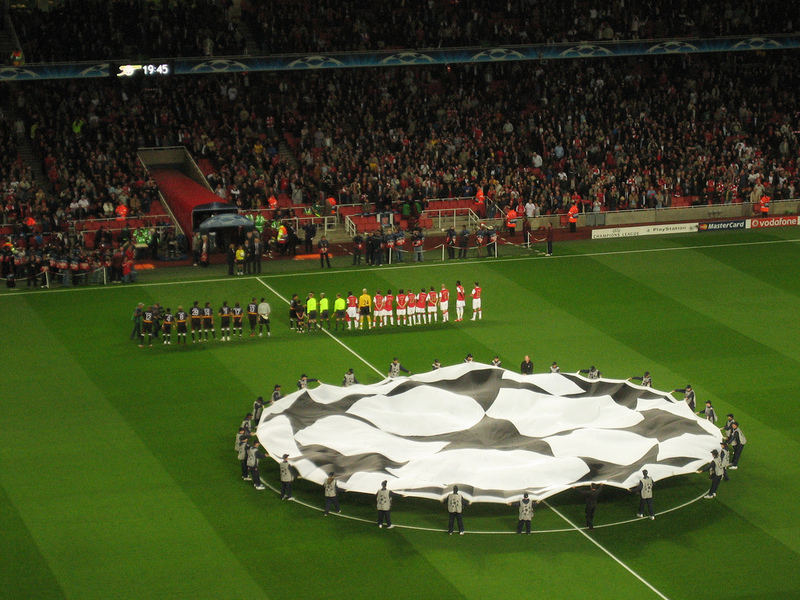 The competition’s logo is displayed in the centre of the pitch before every Champions League match. In its present day format, the UEFA Champions League begins in mid-July with three knockout qualifying rounds and a play-off round. The 10 surviving teams will enter the group stage and join 22 other teams which have qualified in advance. The 32 teams in total are drawn into eight groups of four teams each. The groups then play each other in a double round robin system. The eight winners of each groups and second place runners-up of each group proceed to the knockout phase that culminates with the final match in May. The winner of the UEFA Champions League then qualifies for the UEFA Super Cup which is a battle between the UEFA Champions League finalist and UEFA Europa League finalist. The team also qualifies for the supreme FIFA World Cup tournament. Since 1955, the Champions League competition has been won by 22 different clubs. 12 clubs have won it more than once and 8 clubs have won it more than twice. Lionel Messi of Argentina playing for Barcelona is currently the top goal scorer with 75 goals in 92 games. Close behind him is Portugal’s Cristiano Rinaldo with 74 goals in 114 games and Spain’s Raul Gonzalez with 71 goals in 144 games. Xavi Hernandez also of Spain and playing for Barcelona holds the honor of most appearances with 152. The 2014-15 UEFA Champions League final match will be played on June 6, 2015 at the Olympiastadion in Berlin, Germany. You can get into the action by going to the William Hill website and wagering on your favorite club. Don’t miss out on one of the most exciting tournaments in the world! “Europa cup 1961 Barcelona – Hamburg 5” by Pot, Harry / Anefo – Nationaal Archief, Den Haag, Rijksfotoarchief: Fotocollectie Algemeen Nederlands Fotopersbureau (ANEFO), 1945-1989 – negatiefstroken zwart/wit, nummer toegang 2.24.01.05, bestanddeelnummer 912-4395. Licensed under CC BY-SA 3.0 nl via Wikimedia Commons. “Beginning Arsenal Sevilla” by Kieran Lynam from Dublin, Ireland – Flickr. Licensed under CC BY 2.0 via Wikimedia Commons. This entry was posted in Soccer and tagged Barcelona, Benfica, Champions League Blogs, Champions League history, Cristiano Rinaldo, European cup, Inter Milan, Internazionale, Lionel Messi, Partizan, Real Madrid, Sporting CP, sports and leisure, Sports Archives, Sports Blogs, UEFA, UEFA Europa League, UEFA Super Cup, Union of European Football Association, Xavi Hernandez. Bookmark the permalink.